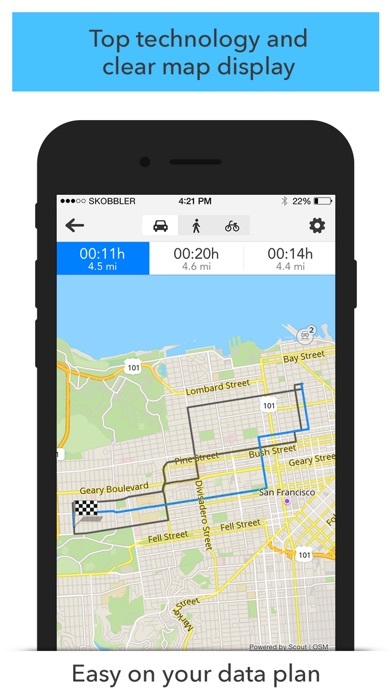 GPS Navigation from skobbler - 3 full-fledged apps in one: Top-rated navigation with voice prompts (turn-by-turn) + World map + Wiki travel guide You get all this even if you are offline. In addition: skobbler NGx cutting-edge map technology. Various search functions. Different map styles. Different route modes. It is quite a package. FULL-FLEDGED NAVIGATION FOR VEHICLES AND PEDESTRIANS, ONLINE OR OFFLINE * Gives you full-fledged turn-by-turn navigation. Functionalities such as speed warnings, street sign displays, 3D-view (isometric) and much more are of course included. All these functionalities are available online and optionally offline (see below). * The already included traffic information feature keeps you updated on the current traffic situation. Avoid being caught up in traffic jams and make a detour round construction sites. * Real-Time Premium Traffic (RPT): This optional upgrade provides you with superior traffic intelligence by international market leader INRIX. RPT will greatly enhance routing during turn-by-turn navigation and displays additional color-coded information on the current traffic situation. 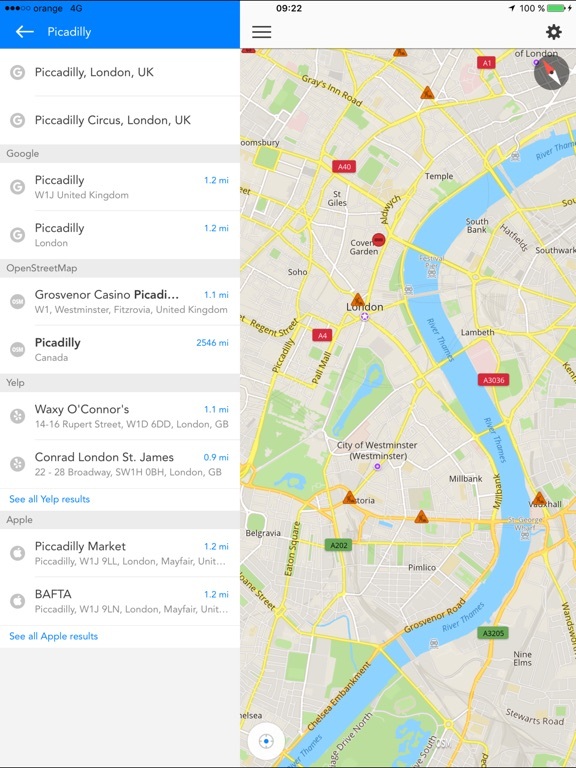 ONE WORLDWIDE MAP RATHER THAN A WHOLE LOAD OF SMALL MAPS, ONLINE OR OPTIONALLY OFFLINE * With GPS Navigation you no longer have to worry about finding your way. No need for paper maps. No matter where you are or where the journey takes you, the OpenStreetMap can be used anywhere. You can decide whether you want to use it online of offline. The entire map is always available online. 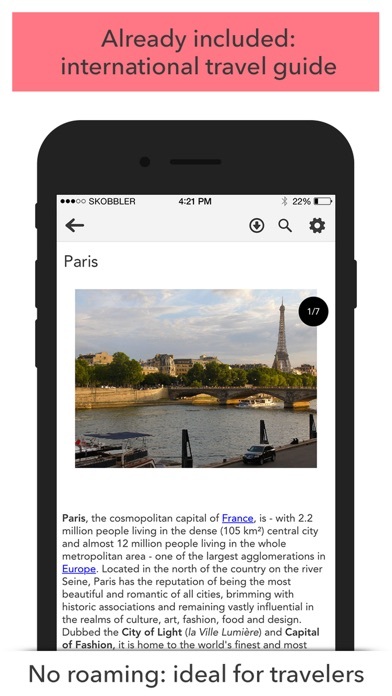 You can also enhance the app for offline use with almost 1000 additions (cities, countries, continents). You get one entire offline country map for free. Download the respective area (ideally via Wifi). Once installed, you will always have it with you, even without an internet connection. And you’ll be able to make full use of all major features. Country maps always include all cities and their street plans or city maps. The map is always seamless. You never have to switch between several maps. 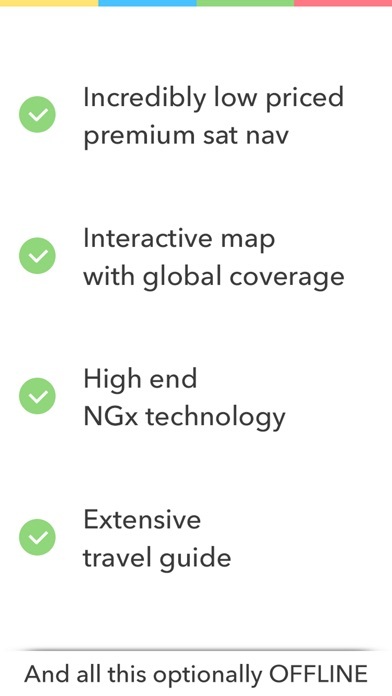 SKOBBLER NGX TECHNOLOGY: TOP GRAPHICS, ROUTE CALCULATIONS, VARIOUS PRESENTATION TYPES AND NO OFFLINE HALF-MEASURES * GPS Navigation includes skobbler's innovative NGx map technology. You get maps that look great and move, zoom and rotate with unrivaled ease. Simply touch the map for slightly longer to interact with individual points on the map. You will never get blurred images or useless empty 'map-loading' tiles. Instead, you get different map styles (e.g. night, outdoor) and a route planner for vehicles, pedestrians and cyclists. Something else you won't find anywhere else: all functions can be used both online and offline (in installed map areas). FEATURES - Full-fledged navigation with voice prompts (turn-by-turn) including Traffic service - Completely interactive OpenStreetMap (OSM) - One single map with global coverage - Can be enhanced within the app for offline use of all major functions - You get one entire offline country map for free. 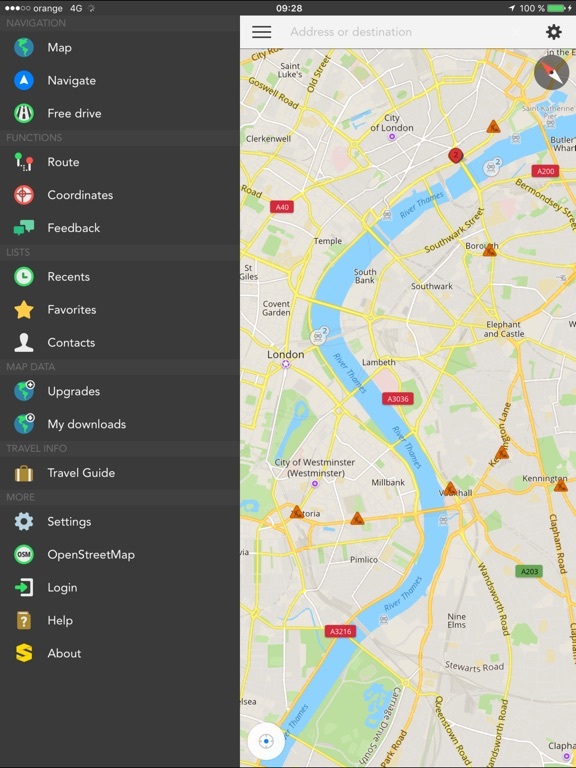 - Full functionality with and (after installation) without Internet connection (online and offline) - Ability to install whole countries including their city maps (Wifi recommended) - Continuous free map updates - Extensive Wiki travel guide - Powerful map technology (NGx) - Route planner (vehicles, pedestrians, cyclists) - Various map styles (e.g. night, outdoor) - Various search facilities - Convenient favorites lists - Optional synchronization of favorites with the web portal maps.skobbler.com ! Please note that as with all navigation apps, continued use of GPS running in the background can dramatically decrease battery life. 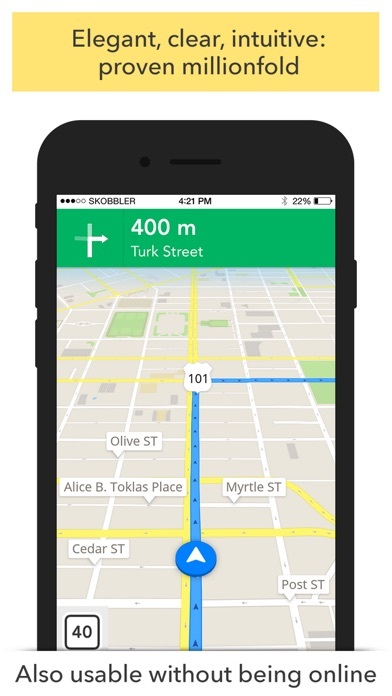 Traffic regulations and current road situations always precede skobbler’s directions! Luv Open Street naps and this app! Luv this app. Live that I can change the voices of the turn by turn navigation. I luv having Homer Simpson. I’ve owned this app a long time, and I use it when I go to other countries so that I can have offline maps. I like keeping the maps downloaded so that they’re there when I need them, however the app keeps deleting my downloads. Furthermore, it’s been a year since the iPhone X came out, and there is still no update to use the new screen real estate. This app has now named itself Scout GPS, and presents the entire UI in German!. As far as I can tell, given that I don’t speak German, it has also deleted all the maps I paid for and downloaded!!! How is it still in the App Store? Turn off on its own. Every time I go to see my address the app turns off. It’s touch n go. About ready to go to another gps app. I would be in a better position to review this application if I could read it. My update to GPS Nav opened up as Scout GPS in what I think is the German language. Have been unsuccessful in searching through Settings (Optionen) for a way to switch language. So I have given this reorganized, merged, or whatever software only two stars for obscureness. Newest update changed language to german. No way to switch back to english. Purchased it years ago and had no problems till recently when I had to reset phone. 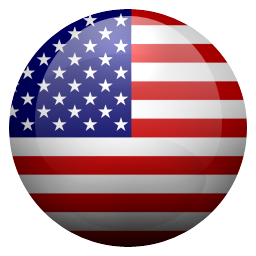 After that I cannot reinstall the United States map. I’ve tried restoring it but it just sits there forever draining the battery while doing nothing. Basically, it’s trying to recharge me for something already paid for. A complete rip off. Resent update change quite a bit, getting use to it I am now understanding the changes. The app function is different as it now uses more map sources, not sure if this is better but it is more confusing... However I primarily use it for the downloadable offline maps, I don't think there are any other apps that offer this so hey here's 5 stars. Does not update new roads and addresses timely. Yikes “Scout GPS?” In German? Seems the latest update is in German. I'm blown away by the bad review I just and read wondering what software that person used. For me, this app performed as well as dedicated GPS units that cost a hundred times more! I disobeyed instructions and it compensated instantly. It warned me twice that a turn was coming up. This navigator is A STEAL at 99 cents! This app does not work and it does absolutely nothing. Waste of money and a scam. Absolutely awful! This app advertises as working offline, I downloaded a map and set navigation while online, but it would not update offline as I traveled! I was lost in the dark at 5am in the morning, very frustrating. The app itself is well designed and implemented. The maps are out of date at places. The app needs an option allowing to pause navigation. I use it all the time in Europe. No need for internet connection. ***THIS APP HASNT BEEN UPDATD SINCE 9/15, LOOKS LIKE THE DEVS ABANDONED SHIP*** THE FOLLOWING WAS MY ORIGINAL REVIEW 2 YEARS AGO. SINCE THEN GOOGLE MAPS HAS TAKEN OVER AS KING WITH APPLE A CLOSE 2ND. I never, ever write reviews because if you're like me you never, ever read them. However, I found it necessary to write a review about this app for the following reason. I've been testing a few navigation apps (6 to be exact) for about 6 months now. I drive about 100 miles every day so I've have the time and patience to test several GPS apps extensively. If you want to know the list here it is...1. Google Maps, 2. Waze, 3. Scout, 4. Motion X, 5. Apple Maps, 6. This Nav app. I'll tell you right off the bat to discard Apple Maps, it's the worst of the bunch. I used each app for exactly 1 month and then I switched to the other. I never used a different one during the month long test because I wanted to give it real world testing and not cheat by switching to another one mid-navigation. I chose 10 categories to grade each one but I won't bore you with specifics. Each Navigation app has differences that make it good but the best all around came down to 3 apps. Waze, Google Maps, and this one. I chose this one as the winner for a few reasons. The most important is for the obvious reason we all use navigation apps. To get from A to B in the least amount of time, and with the best route always being presented. That's what I got with this app. Don't get me wrong, both Waze and GMaps (which are now the same company) are great at routing but I don't like all the distractions on Waze, and if no one reports any activity in Waze the other users won't know about it. The re-routing was ok, not great, it took me on a lot of side street chases. Plus I don't like the cartoonish feel. GMaps had up-to-date maps but I didn't like the fact that you had to be constantly checking the screen to see if the next major turn was slower or faster so I could take it. The street views where outdated, and it never came back from landscape mode if you held your phone sideways. Finally, I left this app for last. I did buy the RPT traffic for $10 since it promised a much better routing experience. The menus could be a little cleaner and less cluttered and I don't really like the fact that I asks you to rate the app almost after every drive. As far as routing, this is hands down the best of all 6 apps. I never deviated from the presented route and on several occasion I found myself on a side streets zipping by huge freeway backups. I was always rerouted if a better route was found and traffic would update about every 5 minutes so it was always up to date. In closing, I still continue to switch between Waze and this only because I like the fact that Waze tells you where the cops are. If they incorporated that feature into the next update on this app I'd kick Waze to the curb. Well that's it, hope I helped someone make an informed decision! The map is awfully out of date. Submitted changes are never incorporated. Does not know one-ways, or streets that exist already for years. Often it instructs to keep to the wrong side. Not great, but will work without internet connection if destination pre-programmed ahead of time. I wanted to find a GPS app to use in the U.S. that didn't require the use of data and tried this one. It's fantastic! I tried it a few times here in Europe before leaving and it worked perfectly. And in the US, in four different states, in several cities and in the countryside it also worked perfectly! What a life saver. Using a data connection would have cost me a lot of money, but with this app I didn't need to. Thank you!! While I find it works well, it drains the battery even when not showing in the app switcher. I've just tried denying it location services to see if that stops the battery drain when not in use. The configuration seems to support it being a little better in terms of battery usage, it still keeps using location services in background. Ending the app is the safest way. Now the spoken directions have stopped working. A couple of directions are spoken, then silence. I needed a GPS app that let me save favorites and this app does it! Great price too! Thank you for this app it's been very helpful as I travel across the country. Good app! Would give it 5 stars if you didn't have to toggle from field to field to input for address searches. Needed to see where we were. This App showed us the Rail Tracks, kept track of our progress, etc. Great for the money! GPS navigacija koja radi, najviše mi se sviđa jer ima opciju biciklo koji vozim kao lud u poslednje vreme. Love this app!! I depend on it for all my adventures work & otherwise. Doesn't mean that there isn't occasionally a misguided path (all the more reason to still know how to navigate independently of ANY GPS) but so far has always got me where I'm going. This is my go-to software for general street navigation. It has some flaws though. The most glaring flaw is that it still does not show the street where I live. I have lived here for nearly three years and the street was here for some additional length of time before my home was built in January of 2014. Is that the only needle in this haystack? Not likely. So there are surely a lot of other roads built in the past three years that are not shown on the maps. The maps seriously need an update. Do not get this app! I am a new driver and I put in the address to my grandparents and it took me onto the highway. It should have just taken me through town. I have never been on the highway before (I am 19) and I panicked and I got in a car accident on the highway going like 70. I almost died. Please DO NOT get this app. It rerouted me to go to Phoenix when I live in Tucson! 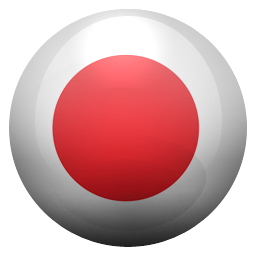 I use this app offline on iPhone. Set navigation with free wifi at McDonald's. Almost as easy to use as a std gps device. Easy to see maps, easy to understand directions and reasonably accurate. Since it was free I forgive any outdated directions. Never gotten lost. I used this app just yesterday as I drove thru unfamiliar terrain, and it got me exactly where I needed to be with no problem! AVOID THIS APP! AVOID THIS APP! While I was going to school with this GPS, it was giving me the wrong location. Maybe this gps isn't compatible with the location. Also it was giving me the wrong route. This app is so junky and to the trash it goes! Works better than apples maps. It's been very helpful each day. This was one of the best apps I got for my PAD! Easy to get directions and easy to follow. Making in NE USA bad. Difficult and inflexible to use. Awkward to stop GPS. Apple or Google maps better. A plus is giving speed limit on road. Cheap but not worth the cost. Very dicent for the money. Excelent price, pretty good navigation, excelent menu structure with confusing and non-intuitive interface. Navigation is quite accurate, on par with TomTom and Google, but display can use some improvements, such as "Lane display" at exits and major road intersections. Better GUI won't hurt either. When I tried to add "Favorite" destination first time, took me 6-7 attempts to find out the last step is "map" button. Couldn't they just say "save" or "add"??? But overall a very nice product, and you can't ask for more for 20 dollars. These maps are wrong. The street where I live is mis-labeled as a different street, and that makes the whole navigation useless. Awful! This is a solid app that does a lot for free. Battery drain can be an issue, but a car charger is probably something most phone users already have, problem solved. More like a traditional gps unit than google maps, thank you! I was dreaming of this app. I'm so happy that it actually exists. Such a beautiful and refined interface bringing crowd sourced reliable data to my offline device! 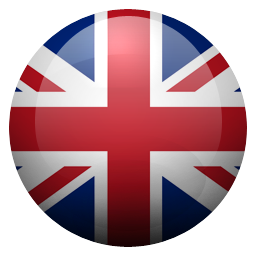 I am able to get directions to any country in the world, search addresses, pois and more. This will be a lifesaver in my car trip to South America. Thank you! Do not depend on this aweful app! The app is marketed as not requiring a data plan for GPS function. BS! You require either a data or WI-FI signal to do a new navigation. Also be prepared for the app to constantly lose your saved settings such as navigation fastest route! Be prepared to spend 5 minutes reconfiguring the messed up settings before using the app! Good thing it is low cost. Well now I have to find a replacement GPS with voice navigation that truly does not DEPEND on wi-fi or data. Avoid this app! Crap! I live in this app! It's awesome! This app is not what I'm used too. Not very intuitive. Couldn't figure out how to show ETA, as the vehicle indicator advanced past the top of the page the map wouldn't update, and I couldn't get the sound/voice to work. Not worth my money or time. Scout Maps is still the best navigation app out there. Highly recommended! This app. works in perfect harmony with Openstreetmap.org. You have to understand how OSM works to fully take advantage of the benefits of this App. I love the fact that it pulls data from your and/or already customized POIs set in OSM, flawlessly. Now I travel light (with only my iPhone) and navigate all over Africa and other remote parts of the world where cellular signals or cell site data is non-existent. Love it!! Very detailed and handy! I really like the app but it is a real battery killer add others have said, even when force closed, or is the number one battery drain in battery usage for me. Only way to stop it for me is to delete the app. Other item is maybe a feature request but it should have the option to launch into free drive mode as that is how most people will use it. Excellent app. Couple of suggestions: 1) Needs ability for multiple waypoints/stops, including automatic routing based on the most efficient route. 2) California needs WAY more points of interest. Hardly anything right now. Was surprised that airports could not be looked up in POI or by names. This app almost ruined my holiday. Had to buy data and use Google maps. No response after repeated emails. I bought two downloadable voice packages & had to reinstall the app. Now, the entire section where you purchase the voice packages is completely blank - except for the prices of course! Yes, you read that correctly - when you go to the screen to buy a voice package the only thing that shows up on the screens are the prices for the various voice packages. Avoid this app! I've tried several off line nav applications and this one's best in every way. Maps are accurate, user interface is great, you can have maps of the whole world for a few more bucks. And it's faster then google maps since everything is already on the phone. Awesome. Update 12/31/15: battery drain still not fixed. Left overnight, application not running in the background and not used and ended up with 33% battery usage. Update 09/24/2015: the latest versions are using up the battery without even running in the background. It became impossible to have this app even installed on my phone now. I've waited a couple of months and tried it twice and no improvement. I spent money in-app so it's not free. I see 15-30% of the battery gone even after killing it and with background refresh and location services disabled for it. I've use this app for several years now, and it does what I want it to do very well. I simply wanted an emergency nav app for those times when I might not have a data signal. I tried other offline map apps, but they were either too expensive or weren't as comprehensive as this one. Good value! This is the best map with offline capability, even in a place like Riyadh. I use it instead of a Garmin or other GPS in a city with few street names. This app got me along a 360-mile trip, safely and without any fuss. 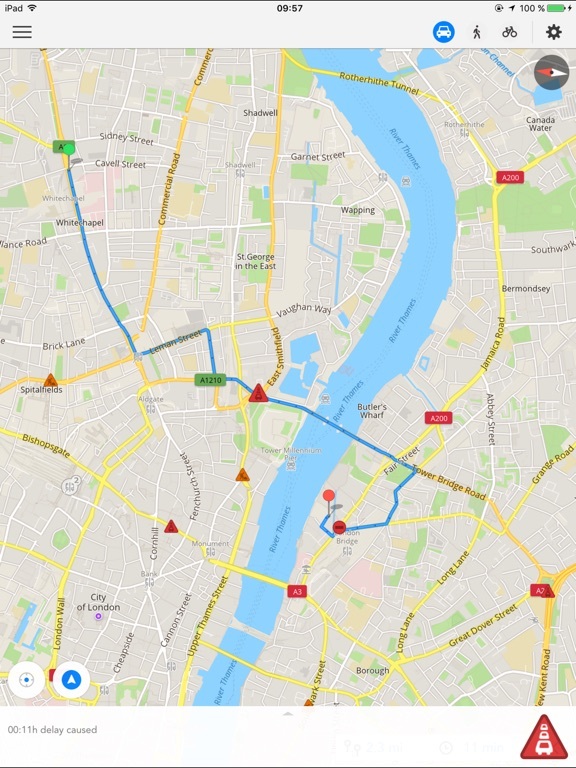 It's great to see open-source data is coming along so well, and GPS Nav showcases the best of what it's capable of. High hopes. This app is hands down the best offline GPS on the market, and I've use many alternatives in the process of looking for this one. GPS Navigation has more features for less money than any other app in it's field. It is extremely functional, and the User Interface is clean, fast and friendly. The app could use a much better search function especially when offline but overall it is a good app. IT IS A BATERY KILLER ... NO GOOD AT ALL !!! The app is based on OpenStreetMaps. This is great. But the offline map needs to be updated frequently to reflect the latest changes to the OSM data. Seems like the app doesn't download the most recent version of OSM data. Other shortcomings include: 1- Street Names do not support Arabic transcription. They can't be read. 2- Voice Navigation needs improvements. The voice doesn't help on lanes and which lanes to keep before reaching a turn. 3- Settings are not stable! Each time I open the app I have to reset Ml/ft to KM/m . 4- Zoom levels are too far for navigation. The zoom levels should be based on driving speeds. 5- OSM provides "max speed" data for all types of roads but the app doesn't use this data to warn drivers of over-speeding. The previous ap I used - Telenav GPS Plus was great, but is no longer supported on newer devices or IOS releases. Trying to get started just indicating where I wanted to go this morning was complex and time consuming even with having played with the ap a little a few days ago. Good thing I knew where I was going, because it gave me the wrong Street name for the first few directions. It then directed me onto the freeway as it should, but then didn't tell me what was next to set my expectations. Was I to drive 5 miles, 10 miles, er what? When it was time to get off, I never would have known the exit by the ap directions which were different than the freeway signs. Silence followed the exiting instructions and there were no directions what to do next. It suddenly told me to turn left which I was already prepared to do, but only because I knew where I was going. It did find my destination as I was driving past it!!! This ap is junk and into the trash bin it goes! Works very well on my iPhone 6s. I loved this app. I downloaded the map of Italy before leaving on vacation, and the app was great, used both online and offline. Google maps couldn't find my destinations, but this program never had me lost. Also had info about speed cameras and traffic. No complaints, only praise. i like the new updates.I just hope they do what there supposed do. Battery killer. Gave me the long way there, but very accurate. It is a great help. I can just keep it plugged in while driving. Works great as an off-grid gps app, but searching for locations to route to is so difficult. Why do you force me to fill out address, city, state separately? Why can't I just search businesses in the categories without being forced to choose a category first. Most annoying search UI ever. An offline solution is great to have, and this is one of the best. Been using this since iOS 5. Actually a good app, but an absolute battery killer. And that kills the app. It uses location services even when in the background and "Location" is set to "While using". You have to quit the app in order to stop battery drain. How useful is that? Non other mapping app that I know has this issue. Need to say freeway north or south when changing freeway. This app was great. However, even without having the app open, it was making my devices die within hours...even if it was just on standby. Apparently, this app took 91% of my battery life every time it was used. Had to delete off both my iPad and iPhone. Shame until it gets fixed. Just downloaded and have not tried it yet. I am pretty happy with my current google maps/GPS but will give this a shot and update asap. Offline maps for Italy work great for walking around Venice and Padua and Rome and Florence, but it is kind of a battery hog and tends to declare that you've arrived before you reach your destination. This app is very cumbersome and glitchy. It works very differently in offline mode than online mode. Be prepared for to experience much frustration in learning to use this app. This app can be useful in areas where there is limited cell service, however you must input the destination while you are in a wifi (online) mode. I mostly use my cell phone for map and navigation. I use this app on my iPad in offline mode as an overall view of my location in relation to my progress alone a trip route (because of the IPad's large display). Don't waste your money and time on this app unless you have a large screen device with 'stand alone' GPS capability. This app is kind of like a crappy and older 'stand alone' GPS device. I will say that this app has potential but it needs a lot of work. I basically give it a 'thumps down' in offline mode. I thought the app had potential however I had witnessed my phone struggling to charge and draining like crazy the past few days. I wasn't sure why and looked over settings/general/usage where it details battery usage by app...only to find 80% over the last 7 days was used by this app even though I wasn't using it anymore!!!! On a side note I also tried to buy a map while in Europe: selected buy a country only to find no available map whether i was making a search or not. Big piece of crap!!!! This started off as the “goto” gps app that I thought I had finally found. It had all of the features I had wanted. Easy navigation, beautiful maps, speed notifications, easy searching and route planning. Problem is, only half of these actually work. It never warned me of going over the speed limit. Not even once. It also completely drained my iphone 6 plus battery in a matter of hours. Even though I had quit the app and not allowed it to continue. There is a serious bug in this app. I used the battery usage feature to narrow the problem down to this app. I finally had to delete this app and the battery drain finally went away. Sadly, I am going to have to request a refund. However, if they fix the battery drain issue and fix the speed limit issues (or stop advertising they have this feature when they truly don’t) then I could easily see this app becoming a 4-5 star app. Just don’t waste your money now. I went with Sygic For long trips and waze for local trips.